Home › Arabica Coffee Bean Oil Brazilian. 0.33 Fl.Oz- 10 Ml. 100% Pure / Roasted / P..
Arabica Coffee Bean Oil Brazilian. 0.33 Fl.Oz- 10 Ml. 100% Pure / Roasted / P..
ARABICA COFFEE BEAN OIL is PURE/ UNDILUTED / VIRGIN / UNREFINED CARRIER OIL with no chemicals or synthetic solvents. Non toxic, does not clog the pores. Absorbs quickly, leaving a light, non-greasy feeling. Not tested on Animals, DOES NOT CONTAIN ANY PRESERVATIVES. ARABICA COFFEE BEAN OIL is suitable for all skin types, especially for dry/ flaky, sensitive, and mature aging skin. Improves elasticity, tone, encourages regeneration of skin cells. 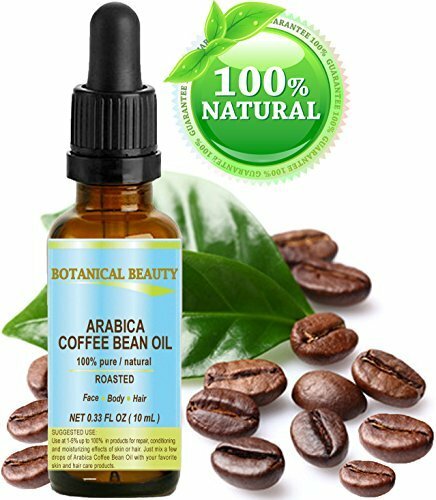 Used topically for WRINKLES, SCARS, STRETCH MARKS, RASHES, BURNS, ACNE SCARS, DRY SKIN, CRACKED SKIN... ARABICA COFFEE BEAN OIL is highly recommended for DRY, CHAPPED LIPS, ANTI- PUFFINESS / DARK CIRCLES, ANTI CELLULITE. Used topically for ECZEMA, PSORIASIS, CELLULITE, ACNE AND OTHER SKIN CONDITIONS. ARABICA COFFEE BEAN OIL is highly recommended for DRY, BRITTLE AND DAMAGED HAIR to encourage healthy hair growth, repair split ends and increased vitality. Botanical Beauty ARABICA COFFEE BEAN OIL (Brazilian) possesses a remarkable ability to nourish, moisturize and improve skin elasticity, improves skin tone, lifts and gives your skin a healthy glow. It also balances pH and after application the skin usually feels soft and smooth. Green Arabica Coffee Bean Oil is used on face, body, lip, nails and hair. Arabica Coffee Bean Oil is rich in phytosterols that promote excellent moisture retention, quick penetration and good adherence within cosmetic applications. It is also exceptionally high in its composition of essential fatty acid.